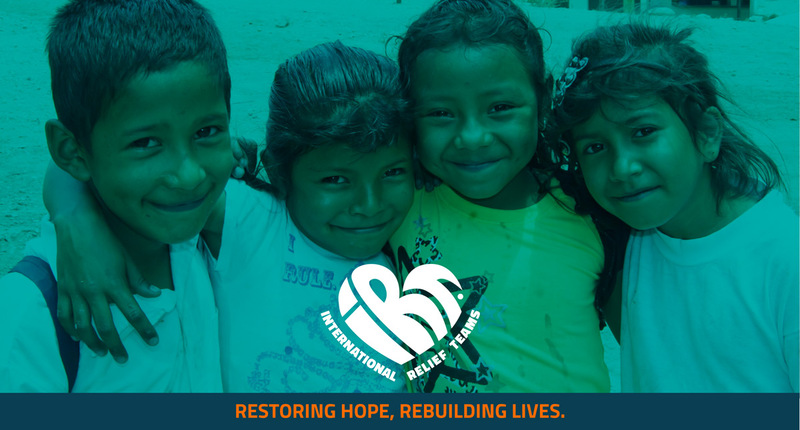 International Relief Teams (IRT) is a vetted non-profit that provides relief aid to those suffering from poverty and disasters, in local communities and around the globe. 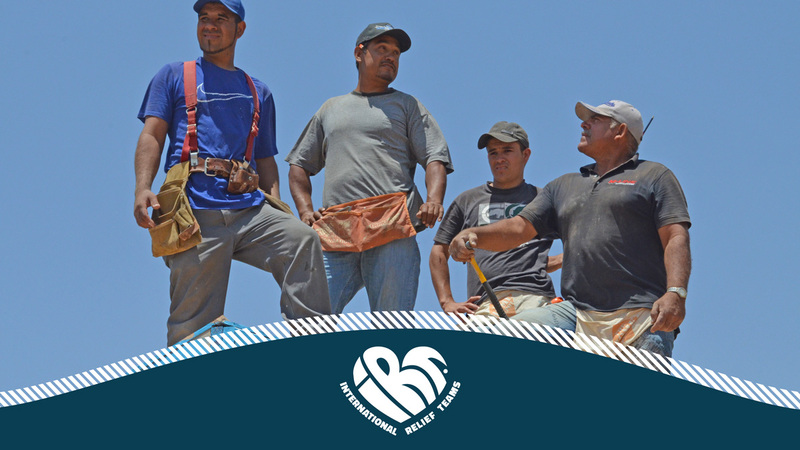 IRT organizes volunteer teams, relief supplies, and other assistance to improve the lives of those who suffer most. 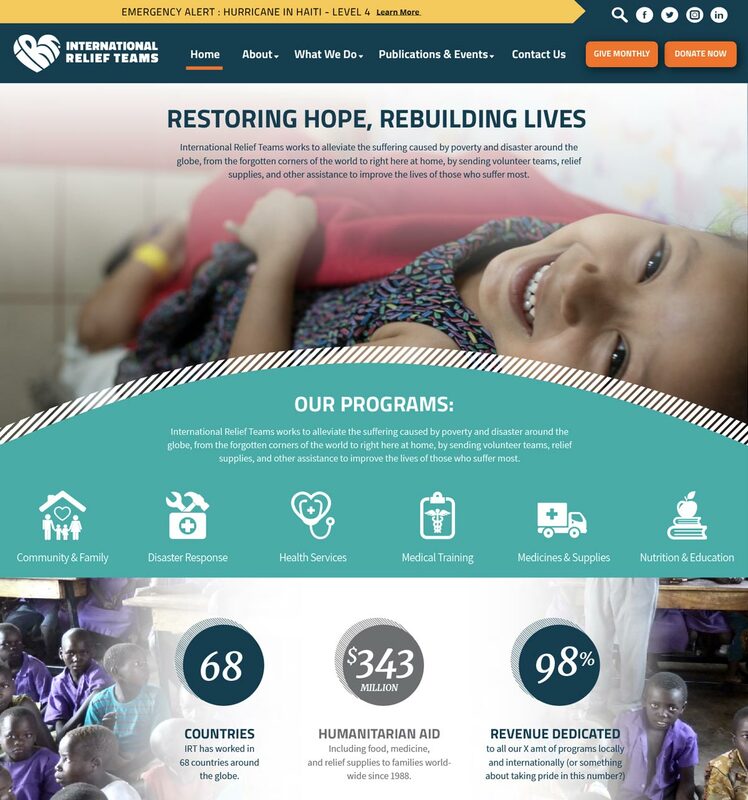 To create a brand renovation for a trusted humanitarian nonprofit that had not revisited their brand standards in almost 30 years. Build a new visual story that mixes extreme compassion and dedication with a look that will inspire future donors, volunteers, and their internal teams. "I loved working with Virginia and Jess at The Cowlick Appeal! They are talented, professional, and flexible – the three most important qualities someone can have. They lead my team on a clear, creative path through the rebranding process and made sure we were happy with the end results. They went the extra mile to make sure we got everything we needed and made lots of little adjustments whenever we changed our minds. I appreciate their work ethic, their commitment to our organization when they signed on to the project, and their quick responses to emails and phone calls. I would recommend them to anyone looking to rebrand!" 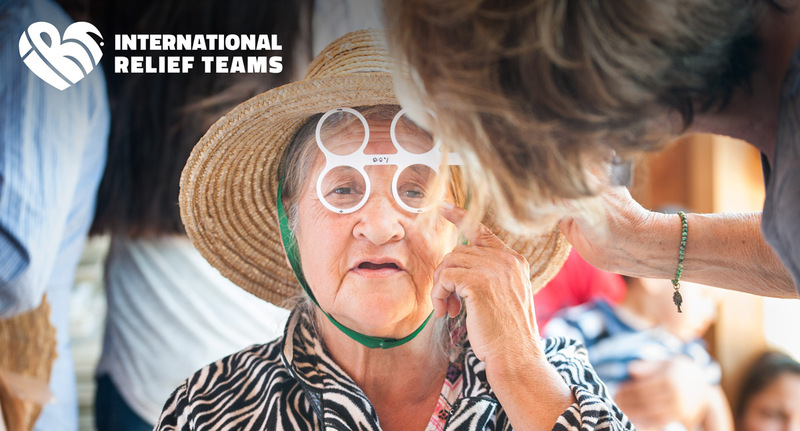 International Relief Teams' non-profit organization is known as "IRT". The new IRT logo creates a custom designed heart using the I-R-T letters, promoting that IRT is 'at the heart' of every situation. Our goal was for the individual IRT letters to have personality. The lowercase, 'i' to the uppercase 'R,' to the funky T, were made to reinforce their vision that everyone is unique with different passions, needs, and community hardships. Another reason we created a heart shape was to represent the compassion and dedication IRT brings to every mission, locally and abroad. 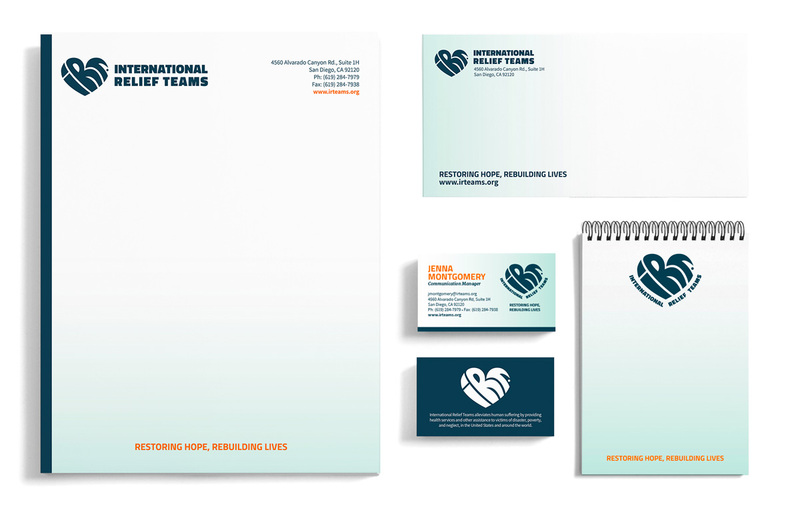 Their company vision is to restore hope - which guided us to create a compact, clean, and contemporary icon, promoting IRT’s core values in a way that can visually inspire a new generation. The colors are youthful, contemporary, and happy, guiding the viewer to feel the emotional results IRT brings: smiles and hope. 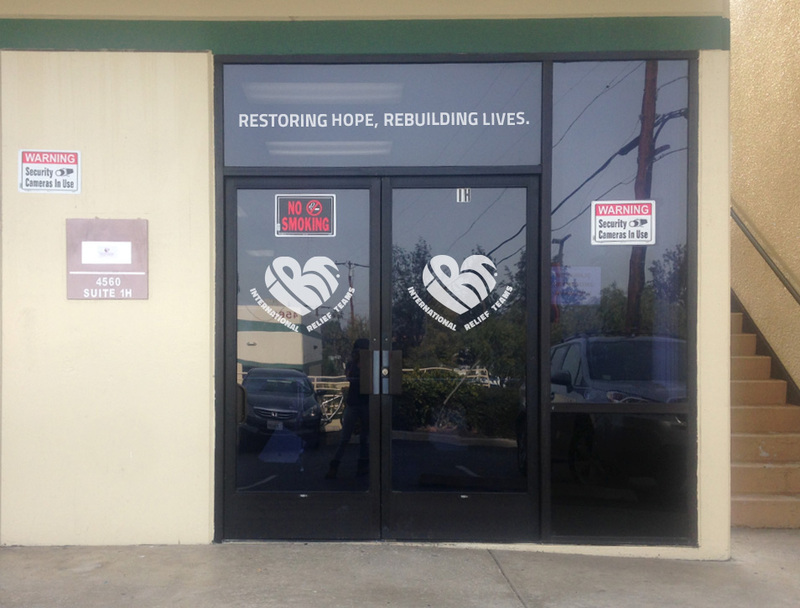 The IRT logo is versatile and can be applied to many customer touch-points as a bold, friendly, and powerful icon. The heart can stand alone or as a badge, allowing more opportunities for a powerful brand reach. Some suggested branded ideas are: t-shirts, collateral, embroidered badges, stamps, corrugated shipping crates, app icons, etc. These ideas will give the IRT team many options to brand their future engagements. 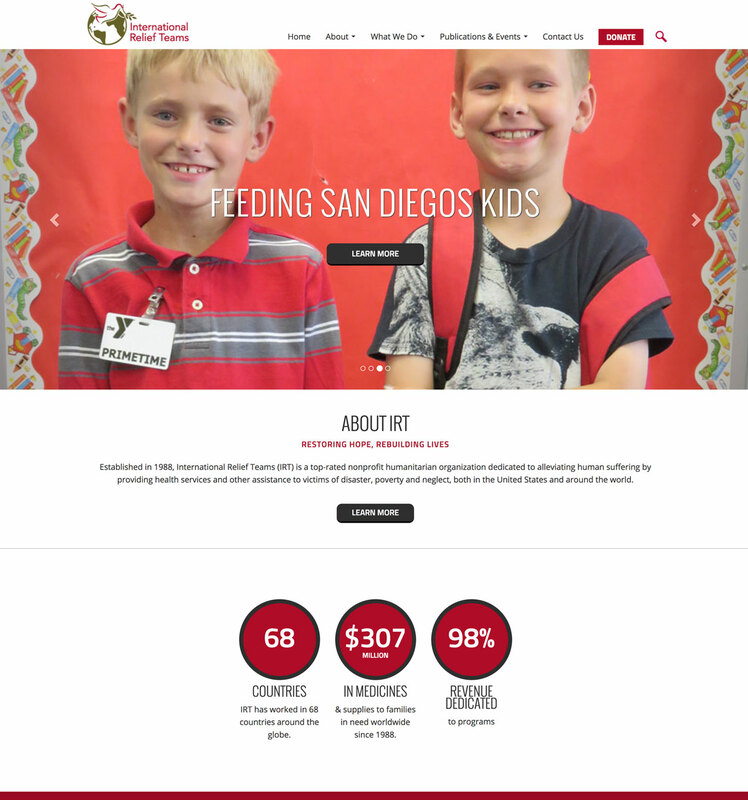 IRT looked to The Cowlick Appeal to create a custom designed website that promoted their new brand feel and provided an easier content management system than their current web platform. We migrated their content over and built their new site on an expedited timeline. Their amazing content needed to shine and be the hero of their story. This allows the user to learn the who, what, why, and how to engage in the primary call to action: to donate. The IRT website now allows the user to access more stories, blog posts, videos, and current alerts all on the home page. We created options for their internal team to promote pop-up alerts for disasters, news alerts, and a way to subscribe new users to their newsletter. Their back-end content management system is easy to use, allowing for their internal team to post new content regularly and efficiently.